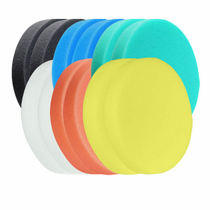 Buff & Shine 5.5" Flat Faced DA Foam Grip Pad� Mix & Match 12 Pack allows you to pick and choose one dozen pads to meet your cutting, polishing and finishing needs. Buff & Shine's high quality foam and the durability of these pads enables users to dial in on precision, high performance cutting, polishing and finishing with ease. The Buff and Shine 5.5" foam pads can be used with all DA polishers and are machine washable. Buff & Shine 5.5" low profile foam pads are the perfect thickness for maneuverability and control. 7 different color grades to choose from. Use the drop down menu to mix and match any combination.